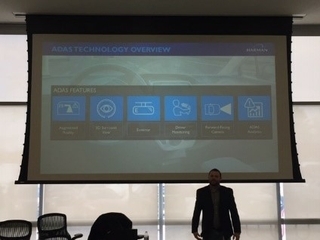 Across several of our facilities, guest speakers were invited to lead discussions and encourage change in the industry. 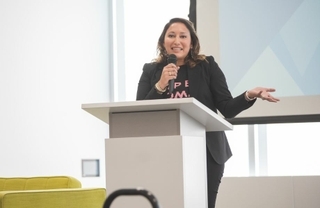 In Novi, MI our HWN Chapter Leaders organized a call-to-action for driving gender balance across the world, which featured a presentation and discussion forum with guest speakers Amanda Roraff, Planet M Operations Manager, Michigan Economic Development Corporation, and Leena Rao, Senior Technology Writer, Fortune Magazine. HARMAN’s own Roopa Unnikrishnan, Vice President of Strategy, visited our facilities in Richardson, TX for a conversation about work life balance, and in Northridge, CA keynote speaker Lani Hall, Global HR & Diversity, Inclusion & Belonging Strategist, inspired attendees with her presentation on diversity, inclusion, and belonging in a professional environment. In Singapore, Lily Koh, Certified Solutions Focused Coach and Certified Image Professional, led a professional development session focused on cultivating leadership presence and business etiquette, and in Karlsbad, Germany, employees tuned in to a virtual Listen Up! speaker event featuring insights into the daily life of some of HARMAN’s female Leadership Experience Acceleration Program (LEAP) participants. 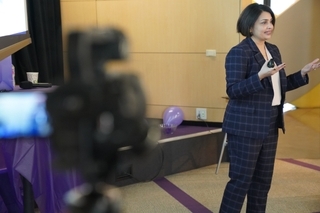 The HWN Chapter in India organize a series of “Balance for a Better Workplace” sessions, featuring guest speakers Major Aditi Mohan, Vice President and Head of Corporate Services for Fidelity, and Dr. Soundarya Rajesh, Founder and Director of the AVTAR Group. HARMAN is committed to providing our employees with opportunities to gain the valuable skills they need to advance their careers. 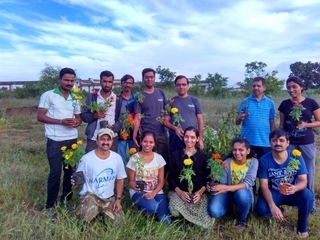 As part of our International Women’s Day celebrations, HWN Chapter Leaders hosted professional workshops and training activities in multiple locations. At our global headquarters in Stamford, CT HARMAN, festivities were kicked off by HARMAN’s Chief Financial Officer, Sandy Rowland, who gave an inspiring debrief on some of the progress HARMAN has made on this front already, while highlighting some of the work that still needs to be accomplished industry-wide to advance gender equality. Employees also welcomed leadership consultants from The Moxie Project for an informative and inspiring workshop. During the “What Holds Women Back” session, attendees identified the obstacles that impeded women’s progress in organizations, brainstormed steps to overcome these obstacles, and fostered their community spirit by sharing their personal journeys and strategies amongst themselves. In Queretaro, MX employees participated in interactive forums focused on gender equality, fostering an inclusive environment, and strategies to encourage women to pursue a career in STEAM (Science, Technology, Engineering, Art and Math). At seven of our facilities in China, HWN Chapter Leaders coordinated group discussion sessions focused on “Finding Your Self Journey” during which attendees explored personal development methods and set their own goals for self-improvement. 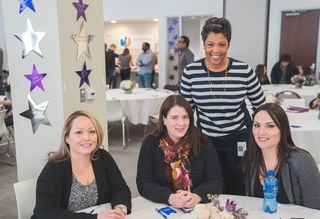 In the weeks leading up to International Women’s Day, the HWN Chapters in multiple locations organized celebratory luncheons, musical performances, and other informal activities where colleagues could come together and celebrate their friends and peers. In Brazil, the HARMAN Brilliant Women Campaign encouraged employees to recognize the women who inspire them, and a popular stand-up comedian was invited to our offices in Hungary. Employees based out of our offices in Romania came together for yoga training and confidence booster sessions, as well as a VIP-night at the local cinema. In addition to the activities led by the HARMAN Women’s Network, HARMAN continues to collaborate and partner with organizations designed to support the dreams and professional goals of the next-generation of women in Science, Technology, Engineering, Arts, and Math (STEAM). For more information about our partnerships and commitment to diversity and inclusion, visit: https://www.harman.com/diversity-and-inclusion.